And three days of below-freezing weather for Kunming. Snow is very exciting and beautiful when you live in a place where you rarely get to experience it. But the cold is a bit of a challenge when you live in a place that isn’t prepared for it. When it’s in the 20s or 30s F outside, it easily drops to the 50s or 40s (or even lower!) inside. There is no central heating in homes, and it’s hard to keep things warm with space heaters, especially when your walls are solid concrete, and all the glass is single-paned. Construction is not the greatest, so doors and windows don’t always seal well. …and you wear a lot of layers, usually including a winter coat, even inside your house. Remember learning about castles in like 3rd grade? And how tapestries were hung on the walls for insulation? 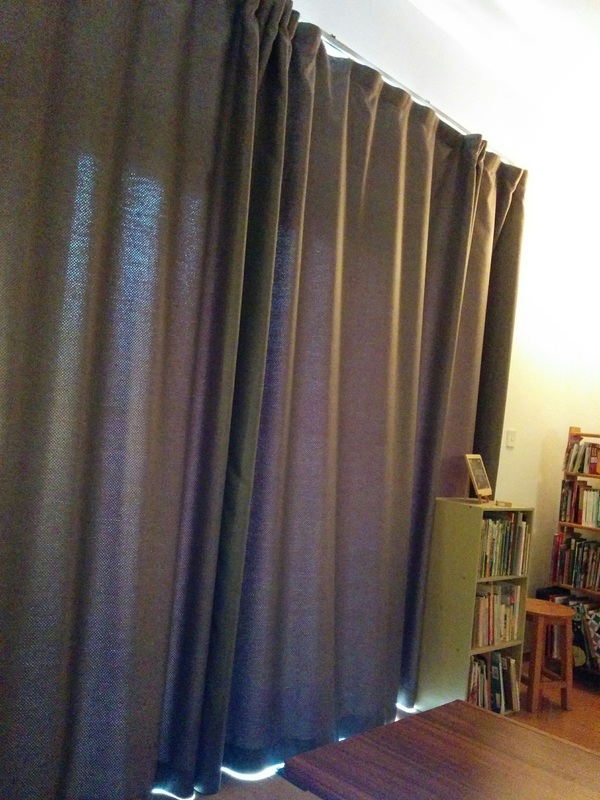 Our curtains are all closed right now for the same reason. When I crack them to peek outside, I can feel a small billow of icy air enter the room. That’s just cracking the curtains, not actually opening a door or window, folks. Building pipes run on the outer walls of apartment buildings, probably to make it easy for the repair guys. (Because jackhammering into concrete walls just to fix a broken pipe is a wee bit of mafan.) That works in normal weather, but it has been a big problem during this cold snap. 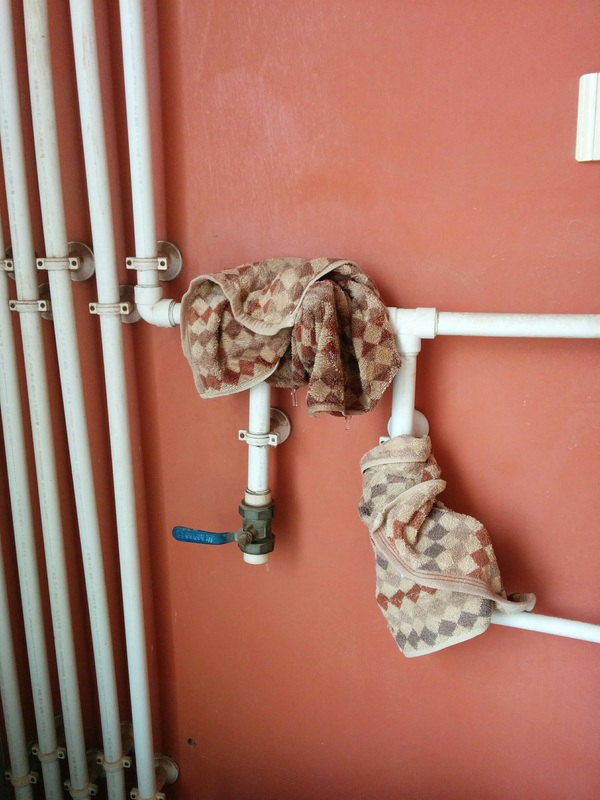 Everyone I’ve talked to in our xiaoqu is without hot water because the pipes froze. Everybody’s heating water on the stove to use for bathing and washing dishes. Or, just ignoring bathing and dishes. We were feeling pretty fortunate that we still had hot water last night. But then we woke up this morning to water gushing out onto our balcony from a burst pipe. Yee-haw. 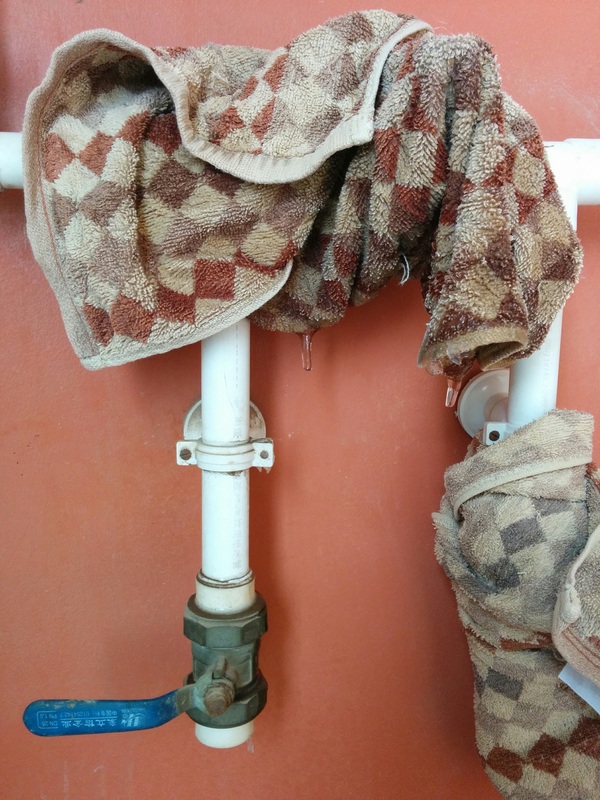 We did triage by turning off the valve and applying a tourniquet to the pipe with some towels. It worked, though the water is still dripping a bit, forming icicles on the towel. The pine trees around here are doing just fine but the poor tropical plants are suffering. We barely had any snow, certainly nothing like what a blizzard would dump, and yet the weight of the snow is too much for a lot of the foliage. 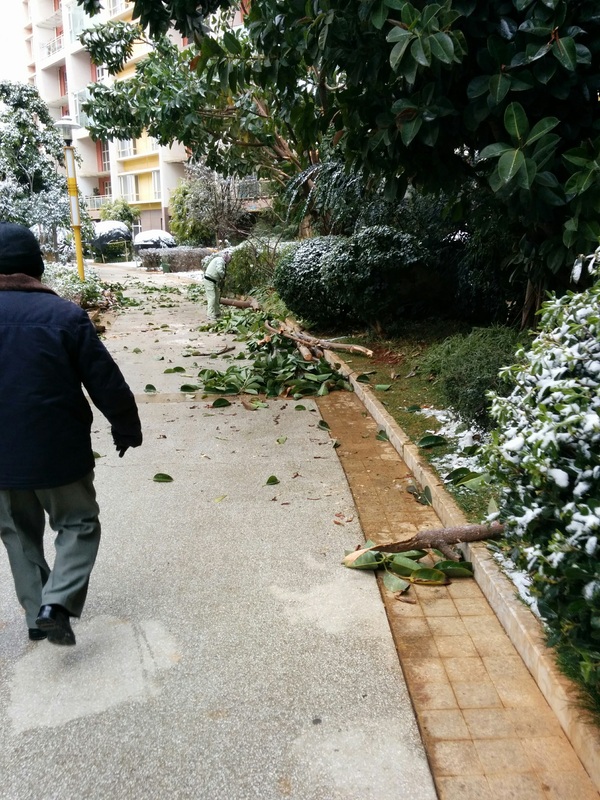 The morning after the snow fell, there were broken branches all over the paths. The maintenance workers have been working hard to clean up the carnage, sometimes amputating half-broken branches. It’s not just the snow. 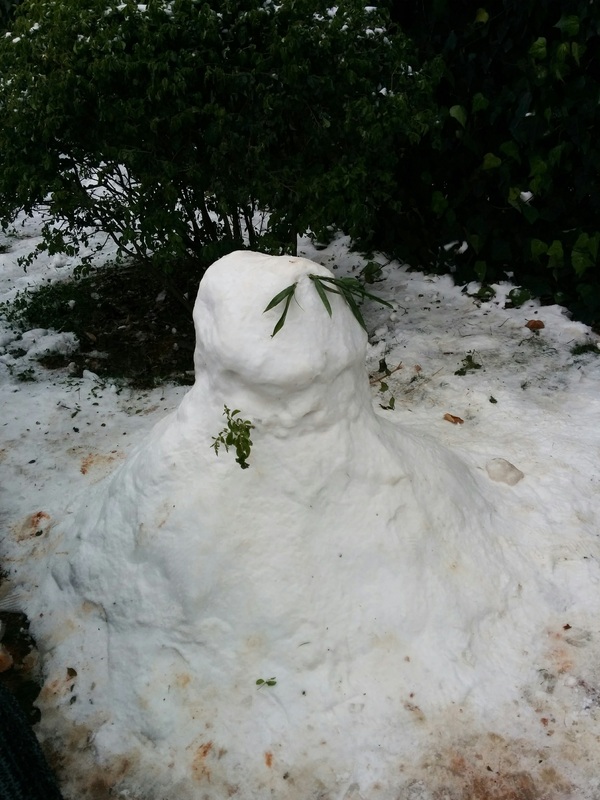 The freezing temperatures are devastating to these poor plants. I’m guessing many may be limp, black, and dead once the snow melts, like what happens to lettuce when you accidentally put it too far back in the fridge. In fact, as we walked around today, I noticed it kind of smelled like lettuce that has been in the back of the fridge. And forgotten for a week or two. I think all our beautiful landscaping might be green sludge in a few days. That’s gonna smell fantastic once the sun hits it. 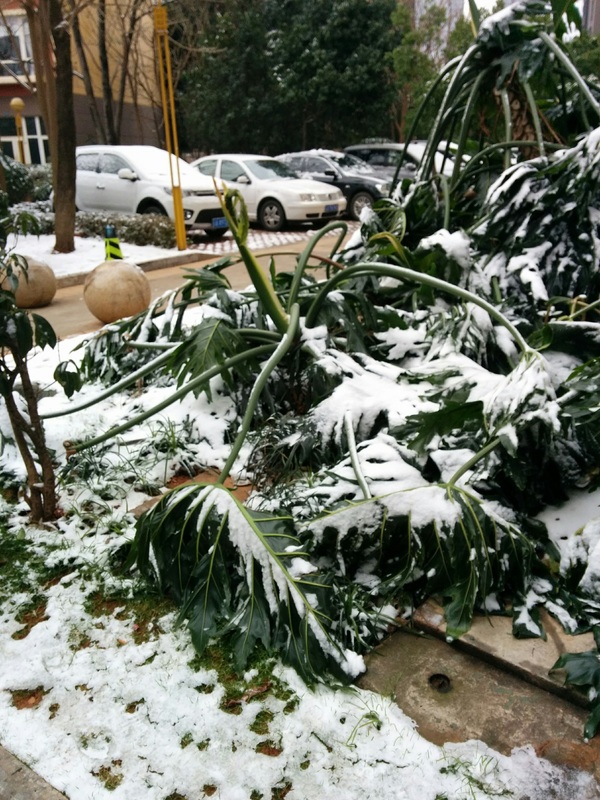 Clearly, having a little snow in Kunming is not nearly as devastating as the “Snowmageddon” that New York and Washington, D.C. are now recovering from, but it still creates problems. Thankfully, the weather is due to warm up again tomorrow. (Highs in the 40sF. “Warm” is relative.) I’ll be sad to see the snow disappear, but I’m really looking forward to a proper hot shower. The Chinese answer to central heat and air is quite simple; wear more or less clothes. As I am typing, here in sub-tropical Guangdong Province, I am wearing more clothes, many, many more clothes. My kids have all gone off to their various winter camp classes and the wife is teaching a couple of Hong Kong boys English. I stayed behind because i need to make lunch. Something hot. I love this detail because I get to bask in the warmth of boiling water as I prepare dumplings. 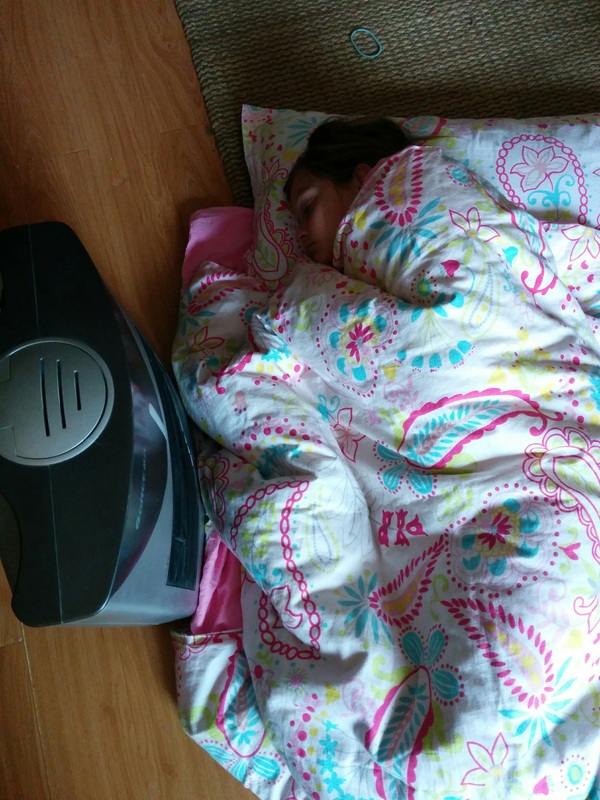 I am American, I insisted on a full size oven, which I finally bought on JD.com. In my oven bakes a tray chicken wings to go with the dumplings. The oven also exudes wonderful warmth. My only regret is that all this ends after lunch when it will be my turn to brave the cold. I will take a bus for forth minutes to my school where I will teach for a couple hours. I can tell you in advance my students will be dressed like Kenny in South Park, nothing visible but their beautiful almond eyes. I will be able to tell they are talking by the plumes of steam escaping their hoods. Wear more clothes they say, summer is coming. 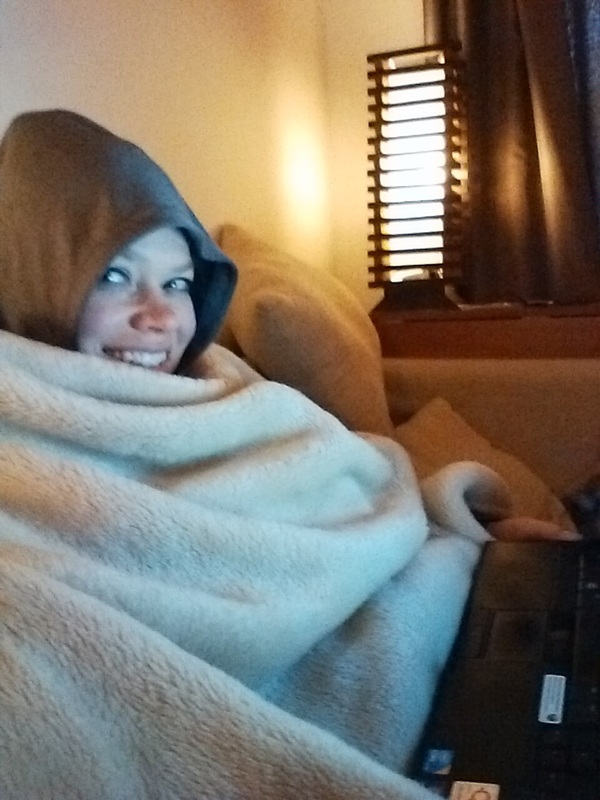 “…dressed like Kenny in South Park…” Perfect image of what we all look like right about now. Enjoy that giant, warm oven! We’re having hot pot at home tonight and will be sticking our faces over the steaming pot at the table, I’m sure. I am so sorry for your cold toes! In Sanya it has been at 9C for 3 days so we had to go buy blankets! Sheets don’t cut it for these temps. And I’m thankful the kids each own one pair of long pants (I’m drying them over the water distiller vent at night) and I had the presence of mind to bring their jackets when we moved here. But otherwise its just been a pleasant experience to have a sensation I’ve missed since I got here–feeling snug and cozy under blankets while I sleep in cold air! I hope your home warms up soon and the smell of rotten lettuce goes away soon. I’ve heard Kunming is cold inside apartments in the winter. And I was so grateful when we lived in Tianjin that we were considered north enough to have heat, but the gap between the onset of cold and the start of the heat was always miserable. Probably something like Kunming any time it’s cold. 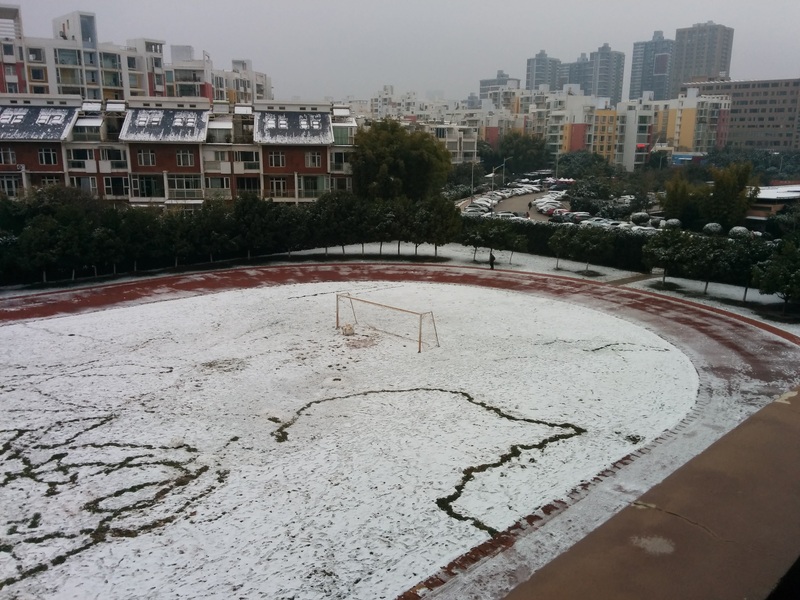 Guangxi and Yunnan apartments are pretty cold during the winter, but thankfully I’m like Queen Elsa in that regard. “The cold never bothered me anyway!” I’d much rather be adding a scarf or hat than sweltering in heat and humidity, so I’m good. 🙂 The sun came out today and all the snow has melted. Still no hot water, though. I’m glad the massive cold front has brought you guys some really pleasant weather, but it sure is ironic to need jackets and blankets in Sanya!